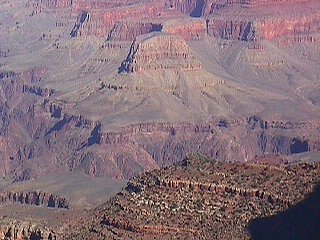 Sited at the bottom of the Grand Staircase, a large natural formation that can be seen from space, the Grand Canyon is a truly beautiful "hole in the ground." My tour of the area was limited in time and, being on a bus, also limited in stops and picture opportunities. But, even so, it was spectacular as this general view from the Bright Angel viewpoint (our first stop) shows. Join me here for a tour of the area, starting in Williams, Arizona; traveling to the Grand Canyon by train; and then stopping at the most popular viewpoints a bus can easily reach. I won't bore you with facts and figures, but if you really want them, click here for a park history and any number of measurements. We start our tour in Williams at the Fray Marcos Hotel and the Grand Canyon Railway.